Thank you for visiting the creative studio of Paul Janus Building Arts, it’s a pleasure to share an appreciation for beautiful, livable interiors with you! Today, a shared perspective in design and artisanry inspires the difference in each and every interior. 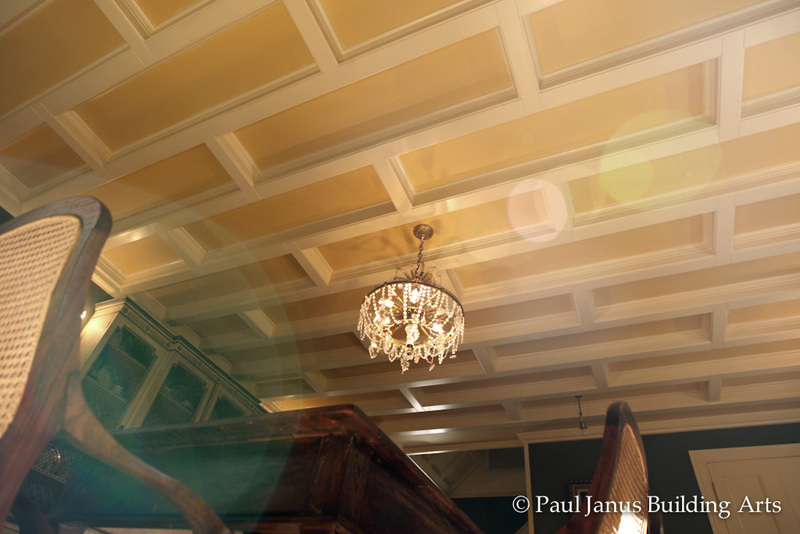 Paul Janus Building Arts brings color, pattern, and light together to create stunning millwork statements in beautiful spaces. 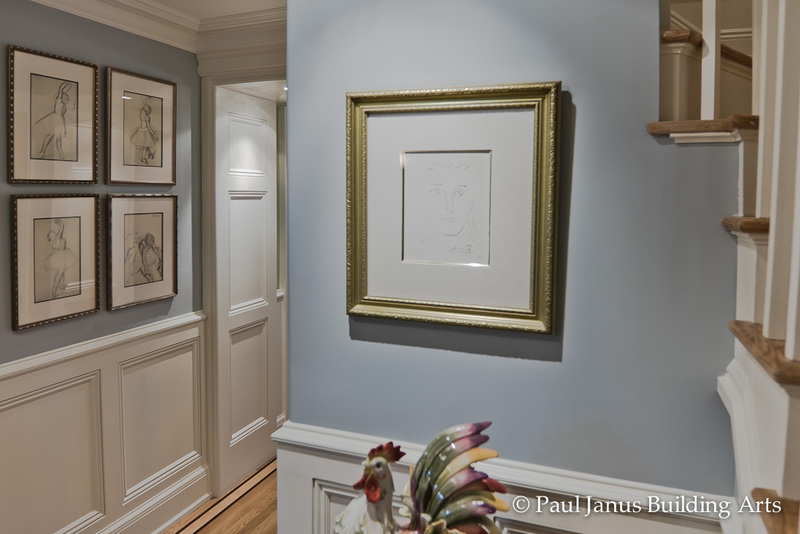 The studio owes an auspicious beginning to a career hiatus from interiors product design, when in 1999, Paul embarked on converting his Manhattan brownstone offices into chic office and pied-à-terre apartment. The project’s success led to a second renovation on a historic property Upstate looking over the Hudson. These two sweeping projects would crystallize millwork’s mission in splendid interiors and lay groundwork for one of select few architectural millwork firms to earn a place in NYC’s Architectural Digest Design Show. Paul holds a Bachelor of Science in Industrial Design from the University of the Arts — formerly the Philadelphia College of Art, graduating with honors in 1984 to receive The Joseph Carriero Memorial Award in Industrial Design. He went outside his design major to study artisanship’s fundamentals and satisfy a fascination with material, process and layout practicing bookbinding, glassblowing, architectural model-making and surface design. He focused next on New York’s hotbed design scene, and in 1987 cofounded Manhattan-based consultant and surface design pioneer Simon-Janus, Inc. 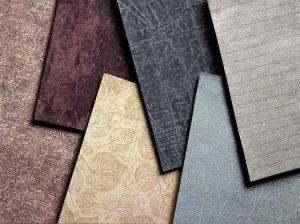 The firm designed award-winning interiors products across an arena of world-class brands including Schumacher, Mikasa, Martex, Armstrong, Nevamar, Knoll, USG Interiors, Hunter-Douglas, and internationally many others. His color and pattern work has been represented in New York’s D&D Building and is in the permanent collection of The Cooper Hewitt, Smithsonian Design Museum. Discerning clientele and bold challenges — experience that’s honed a sensibility of style and purpose, and a creative service borne of 35 years bringing imaginative ideas into being. Oh my God Paul it’s gorgeous! Wow, really beautiful, congratulations, incredible! Dear Paul, I look at the rooms now and honestly, everyday, Rich and I love them so much. We were on the deck yesterday and I asked him if he was sad we didn’t go on a big vacation instead. He said no, because living here is like being on vacation every day. You are so talented and creative. You found a way to make all the angles and lines blend and work together. I know you know how happy we are with your finished product but it is always nice to hear again! Paul is a master carpenter & craftsman, and has a keen eye for design. His vision and attention to detail is amazing. 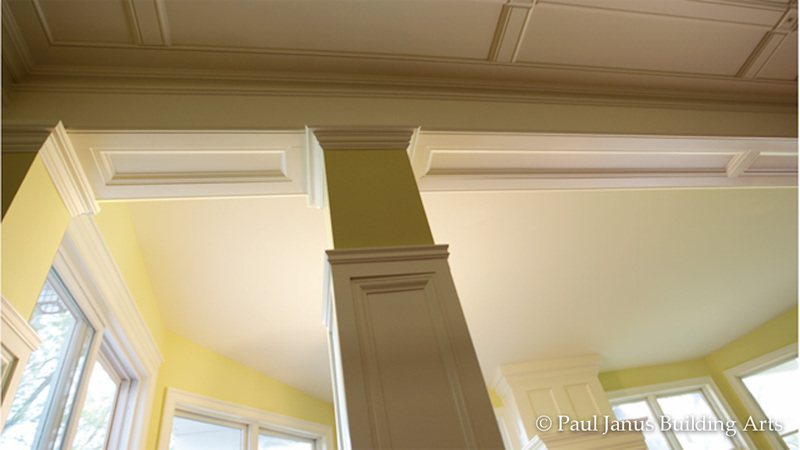 If you have a custom woodwork project in mind - hire Paul. You will not be disappointed! 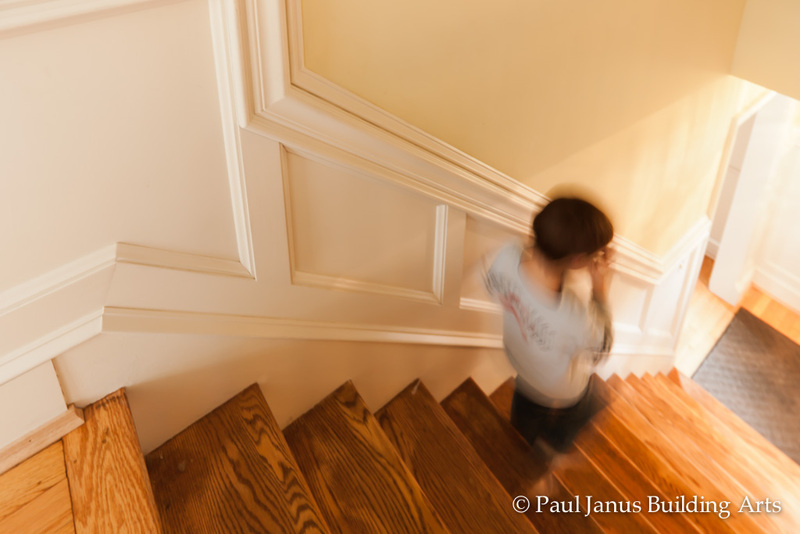 Mr. Janus carefully examines several design options and discusses the pros and cons of each. My husband and I are grateful to Mr. Janus for his commitment to the quality of the completed project and for the high level of concern he gave to budget issues, quality of materials and labor. We sincerely hope Mr. Janus is available for future projects and would confidently recommend his work to our family and friends. Beautiful, thank you for everything!!! I was so enthused by Paul’s imaginative approach to woodwork. I casually asked him what he could do to my otherwise perfect dining room. He suggested a ‘tray’ ceiling to surround my chandelier as well as an updated color treatment that enhanced and freshened my dining room and furnishings, which pleased me to no end. The enhancements to my home make a warm and pleasant surrounding that adds immeasurably to the value of my residence. I could have never imagined all the ideas Paul brought to the table, and I am very happy with the quality of work and improvement he brought to my home. Paul is an artist who happens to do carpentry, someone who combines technical skill, creative vision and diligence. First and foremost, he is a superb craftsman. Beyond this, however, he is capable of seeing a project in its entire context. In other words, he will conceptualize a small renovation as part of a broader whole. In the planning stages, he will offer a variety of design options, including very dynamic out-of-the-box thinking. He literally will see through and around walls, which he will convince you to take down or put up should he believe doing so would improve your home. And he will not hesitate to tell you when he feels your pre-existing designs could be improved! While it took us time to be converted to his ideas, the end product was well beyond our expectations. He earns what you pay him. You will find Paul impressively perseverant, and it is precisely this tenaciousness, this clarity of purpose and refusal to compromise on design, aesthetics and quality that make his work art. Paul, you approached our home by first figuring out what needed to be changed in order to make the whole re-design work and fit in with its natural surroundings. Having been in involved in the Residential Mortgage Industry for over 22 years, I have worked with numerous builders and contractors. It is one thing to be a competent builder/contractor, it is truly unique to have someone who has a creative eye but also the ability to execute to perfection. I recommend you to serious homeowners who are in search for and only willing to work with true craftsmen. Paul carefully surveyed the space, and he was very articulate in his presentation of what would be done, how to go about it, how long it would take, and how much it would cost. He was able to use his vision to transform the space into one that was functional and had visual appeal; the transformation was spectacular! We encourage you to consider Paul Janus for your work projects, as we feel confident in his work ethic and abilities. Paul has a passion for what he does which shows in his dedication to his work. He took time to research and find period appropriate designs from which he then derived his own creation. The finished work was what I expected. It completed and transformed the room, giving our old house back the wonderful character it had lost through time. It was well worth the money invested. In short, I am happy to write this recommendation for Paul Janus. Paul, We have gotten so many compliments on our great room. We often hear the words craftsmanship, artwork, and beautifully finished. We are very proud of the room and how it turned out. Paul, because I have worked in the building industry for years, I know how many “finishers” leave a home. You were always there when you said you would be, your estimates were right on the dime, and most importantly the work was done beautifully and finished when you said it would be. We wish you much success in the future, and we would be happy if you shared this letter with prospective customers. Please keep in touch with us and if you need any references ours will be one of your best. When my children could no longer share a bedroom in our tiny house, I asked Paul if he thought there was anything I could do to add a room that wouldn't turn it into a claustrophobic rabbit warren. All of my ideas seemed to waste space or leave out some essential bit - like a second bathroom. Paul's solution was so elegant it seemed like sorcery. Of course, it is clear from the result that he'd made a tremendous effort in developing the plans for my renovation and following through with construction. But Paul has a way of making it seem effortless. Paul worked on a mantel for us recently. He was given a 17th Century fragment of hand carved paneling, and was asked to somehow make this very damaged item into a working mantel. The results of his efforts were nothing short of spectacular. We are sure to enjoy it for many years to come, and can recommend his work without reservation. Paul, thank you so much for making my living room complete and making Toya happy. Your skill is a wonderous thing. 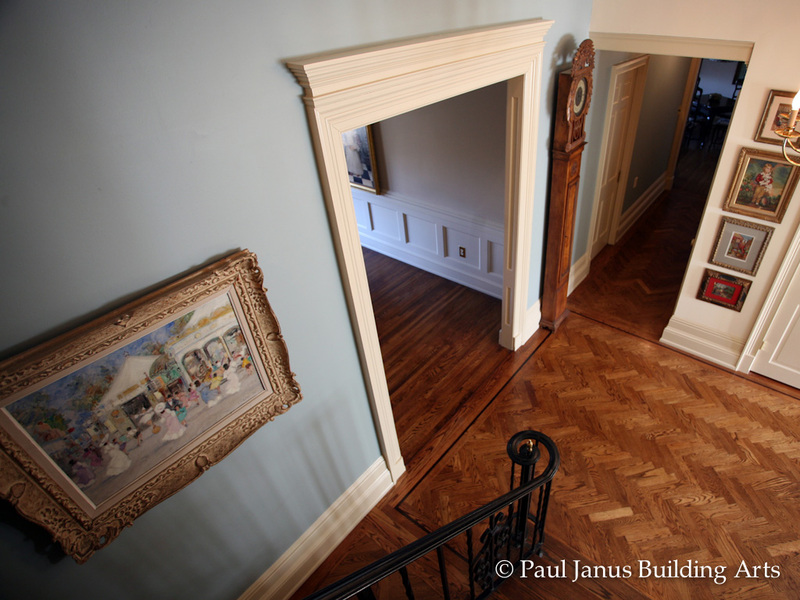 Paul Janus has provided outstanding building design/remodeling services for me. His sense of design and creativity are truly outstanding. Paul was a pleasure to work with. He helped us to create a comfortable, updated and classic dining room and foyer with his custom woodwork. We are very pleased with the outcome of the project. Paul Janus is a brilliant designer, who brings impeccable craft to his woodwork. Paul is an out-of-the-box thinker who uses his experience as a designer and analytical thinker, to create solutions that went beyond my expectations on hiring him. When I bought my home, I brought in Paul to create a decorative floor, and design a beautiful paneled staircase and foyer. The new work feels like it was always there, and its tight construction gives the 65 year old house a fresh, new feeling. Dear Paul, your work is exquisite — we're very happy! Again, thank you. I hired Paul when the original contractor I had hired to renovate my apartment abandoned the project before it was completed. In addition, much of the original contractor's work needed to be fixed. Paul came in and helped finish (and fix) the custom cabinetry, as well as a myriad of other tasks. He was responsive, professional, and a real craftsman. Moreover, he has a first rate design sensibility and was able to actually make improvements in the design, even though he came after much of the work was done. If I were ever to take on another renovation project, there is no doubt that I would call Paul. All work presented is original to Paul Janus Building Arts; credit for collaborative work wherever applicable is noted. Paul Janus Building Arts maintains this website [Site] to present original work including designs, photographs, sketches, illustrations, graphics and text files [Content] for your personal pleasure, information, education, and communication. Viewers are welcome to browse the Site, and may download Content displayed for non-commercial/ personal use only, provided you also retain all copyright and other propriety notices contained in the Content. Please enjoy, and thank you for your interest! U.S. Copyright law protects the Content on this Site. Unauthorized use of the Content is unlawful. All images on this Site are digitally watermarked. ©2004-2019 Paul Janus Building Arts, All Rights Reserved. ©2004 - 2019 Paul Janus Building Arts; All Rights Reserved.